Yang and I meant to picnic last year, but we never got around to it. So, we figured we would since we were going to our old high school. Yang thought this garlicky sesame cured broccoli salad sounded good of the ones I listed, most of which were riffs on citrus and beets; apparently beets aren’t her thing. It reminded her of some slaw she gets at Sweet Tomatoes (or Souplantation depending on where you live), which includes some creamy dressing, bacon (Yang picks this out because her mom has corrupted her perceptions of bacon) and nuts. 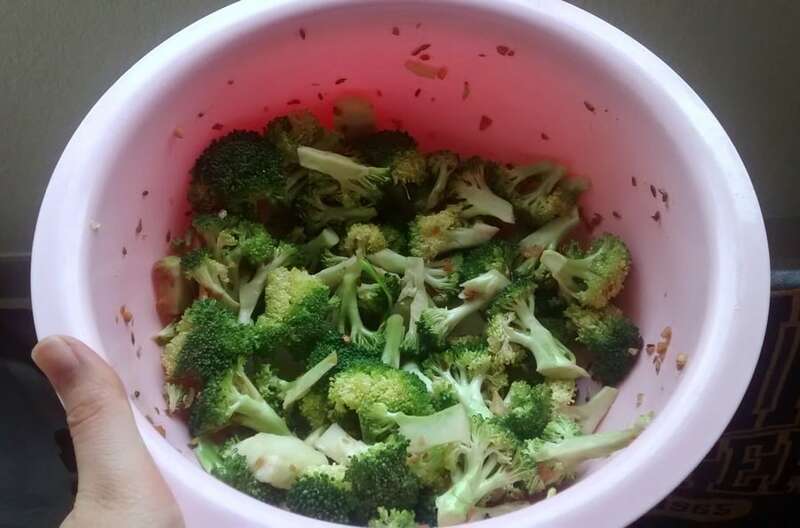 We cut the broccoli pretty small, as we were afraid of it tasting so green because it was going to stay raw. Maybe we weren’t supposed to use the stem, but I trimmed the outside layer down a good amount so I figured it would be fine. I coated the pan bottom with canola oil and cooked the garlic and cumin until golden. Well, I stopped them before hand, but they kept on cooking in the oil. I added a glug of extra virgin oil after, because I didn’t want to cook it before and destroy its flavor compounds. And I definitely didn’t use the full 3/4 cup oil that the recipe originally called for, because dang that is a lot. Then again, there was probably less than 2 pounds of broccoli used, so it’s not like the recipe is totally ridiculous. I let it cool for a bit before adding the oil to the broccoli, since I didn’t want to melt the plastic bowl the broccoli was in. Not the smartest bowl decision, but you gotta do what you gotta do to avoid them dishes. We kept eating it. Dipping questionably clean fingers into the bowl, plucking out florets before continuing with the other projects for the day (watermelon cookies, caramelized onion dip with spinach and feta). Even immediately after mixing when the broccoli didn’t have a chance to marinate it was fabulous. The broccoli was surprisingly not raw-tasting (I think it’s because the acid kind of cooks it, like ceviche). I loved how well-spiced it was, though Yang thought it was a bit much. The unintentionally golden garlic was crispy and wonderful like the fried garlic you get at Chinese restaurants sometimes, though I do think some raw garlic at the end would be great. The sesame wasn’t pronounced enough for my taste, but that’s an easy enough fix if you add a drizzle more of sesame oil or a smattering of toasted sesame seeds. This garlicky sesame cured broccoli salad is easy and so tasty. The broccoli may be raw, but it’s not as scary or so cruciferous as it is when you find it on a crudites platter. In a large bowl, mix the vinegar and salt. Add broccoli and toss. In a large skillet, heat oil until hot, but not smoking. Add garlic and cumin; cook until fragrant, about 1 minute. Stir in sesame oil. Pour over broccoli and toss well. Let sit for at least 1 hour at room temperature, and up to 48 (chill it if you want to keep it for more than 2 hours). Adjust seasonings (it may need more salt) and serve. My friend made a raw broccoli salad for me before and it was so delicious! I've yet to convince my husband to try a raw version of it, so I'll par-cook it and let him try. This looks like a great dressing to go with salads! Raw broccoli normally isn’t my thing either (I steer clear of it on crudite platters all the time), so I bet par-cooking would work great here!